Shopping with and for my existing clients is one of the more fun aspects of my job. I typically keep personal shopping to current clients because I know them, I know their closets, and 9 times out of 10, I am able to choose things that they may not have chosen on their own, but that they love and that works across all aspects of their wardrobe and life. AnnMarie reached out recently needing a few specific things - studs to go with a recent hair chop as she wasn't feeling dangling earrings anymore, summery sandals, and flats for an upcoming trip abroad (jealous!). Confirm what the client needs to buy AND their budget for all of their items. Determine how long the process will take me based on the number of items needed and the custom rate. For this project, I was able to get AnnMarie's item choices back to her within a few days. 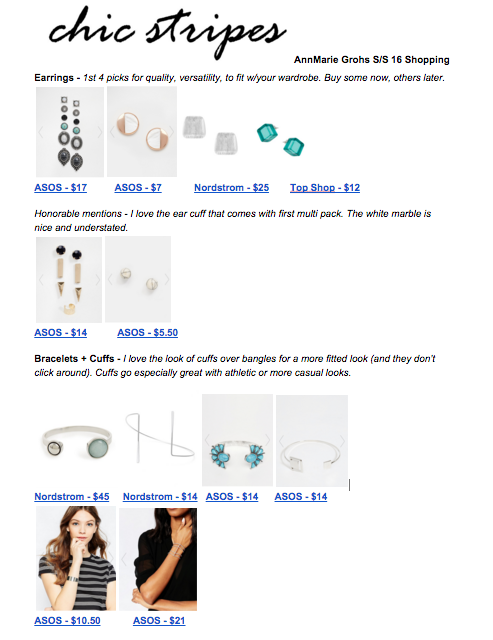 I love giving my clients a variety of choices, so I found between 3-5 options for each category (for AnnMarie: flats, summer sandals, dressier black shoes, studs, and bracelets). I also threw in a freebie with a few links to insoles since she was buying shoes specifically for a trip where she may do a lot of walking. There is nothing worse than breaking shoes in on a trip and NOT having something to help your feet out. In the spirit of sharing, I'm listing a few of the items I chose for AnnMarie along with some other great choices from each of her categories below! I'm listing these through ShopStyleCollective, an affiliate link program. If you purchase anything directly from these links, I will get a commission. If you do choose to purchase through here, thank you for supporting Chic Stripes!